Finally, finally this ginormasaur came out to live with us. Nine and a half pounds. Nine days past my due date. Great nurser. Snuggly and loud and already giving me some three hour stretches of sleep at night, bless him. He even flashed me a waking smile today, the little charmer. We are enjoying some new words: "our son", "our children". It's like when we were first married and giggling over the words "husband" and "wife". I feel he is a wise creature. He knew when to stay inside and then he picked the perfect day to come out. A slower labor, and another peaceful home birth, with our beloved midwife. That's the happy news. We've also had sadness. 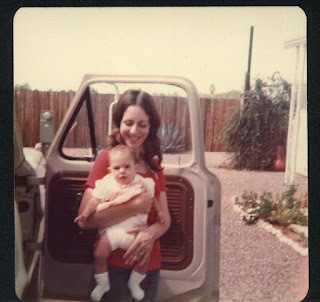 In timing nearly too cruel to comprehend, my mother died a few days before my due date. Loving family came to me, friends brought us food, and over the next two weeks I regained my center and remembered how much I wanted to meet the little one I was carrying inside. I think about her a lot. Doing all the things for him that she did for me. Wishing I could send her the birth announcement. It has been a time of great sadness, great remorse, great anger, great doubt, great emptiness. And it's also a time of great joy, great wonder, great tenderness, great love, great growth. Never has my heart been so stretched. Life has a way of surprising us. I am well cared for, we are all thriving. We know we are so blessed. I feel us finding our new balance together. I'm grateful to have my fabulous husband, sweet children, the warmth of summer, the compassion of friends, and a few months of maternity leave ahead of me. Congratulations, such a cute baby!! And it's so sad your mother couldn't see him, I feel with you..
My daughter too is named Christina and her baby is now 7 weeks old, we'll see him today!! All the very best to you and your family from over here, have a nice time with the little man!! Sweetheart! So glad for your Boy, so sad for your Mum! Enjoy this lovely lad, and may he give you all great joy. Congratulations on you darling boy and on your home birth (coming from a midwife!). What a difficult time for you with the passing of your mum so recently. Sending you love and hugs and know that she is with you in spirit all the way. I'm so sorry for your loss and elated for your new arrival. I just signed up to follow your blog a few days ago, I barely know you and yet there were tears in my eyes as I read your post. I wish all the best for you and your growing family, I'll be following along and watching your new little one grow. I'm so happy for such a sweet birth for you and your family. What a beautiful little boy! He must be wise indeed to give you the healing time you needed. Oh Christina I am so sorry to hear about your mom. My heart aches for you. I'm reading this in the middle of the night nursing and it makes me want to call my mom and wake her up to say I love you. Congratulations on a beautiful healthy son. I am really sorry to hear about your Mum. Having a new baby helped keep me centered when my mum passed and I'm sure your little one will help keep a smile in your heart too. Congratulations om your new baby. I am so sorry to hear about your mom though. I know that must be difficult for you. Rest assured that she knows your son and is watching over you both. I told my mom that although I am not a highly religious person, there are times when certain things happen that I know my grandparents (all of whom have passed on) are up there watching me and taking care of me. I can feel it. The same is true for our mom. Your little one is sure to bring you so much joy and happiness. I hope it helps you through this time. Big hugs. Christina ~ congratulations on a home birth and a healthy boy! He's got such a sweet face. So sorry to hear about the loss of your Mom. Great sadness in a time of great joy. Hope your little son brings you perspective in your time of loss. Oh my goodness. Nothing like baby toes to make you go awwwwwwwwww! oh life can be so cruel. I'm so sorry to hear of your mom's passing. Thankful in the midst of hard times for the beautiful gift you have received. Your son is just so precious. Blessings as you move ahead with life's changes. Congratulations on your darling boy (he looks so much like you when you were a baby!). I am so sad to hear about your mom's passing...life's irony can feel so cruel at times. I just know your mom is there in heart and spirit, celebrating the birth of your new baby. Life sometimes is very cruel.My little brother died in the morning and in the evening arrived my niece. A smile of your babies will help you to go ahead.Your son is just adorable. Congratulations. These days are the best. Gather your family close and know that your mom is looking down and smiling. My little nine pounder has just had her first couple of days at school. Doesn't seem that long ago that she was born. At home too. But it also seems years and years and years ago. Time passes. Congratulations on your newest addition! He is very adorable! I am so sorry to hear about your mother. I am sure she is watching over you and your family. Many hugs to you. Congratulations he is so beautiful!! I am happy he's out to join the family and I can't wait to see him in person! I am so sorry about your Mom I've lost mine as well and I will be thinking of you and your family. I still feel my Mom with me and I'm sure yours is smiling over you now. Congratulations! And sympathies as well. Take care of yourself these days. big big big HUG. I am happy and sad for you, I hope your healing comes in time. What a beautiful addition, congratulations! So sorry to read about your Mom. She is there watching over you and your family every day. Hugs. Wow! That is unbelievably cruel. So happy for your new baby, and having lost a father 3 years ago, I'm afraid I know a bit of how heavy that loss is. My husband's mother passed before our kids were born, and know how difficult that is too. I'm so glad you have great friends and family to help pull you through this difficult time. Take care of yourself!! Your son is beautiful! Congratulations! A home birth huh? I bet that was so nice. I can't tell you how happy I am for you. This is just wonderful. I'm sorry to hear about your Mama. Congratulations, very sweet face. Sorry to hear about your mother. Sending hugs. Christina—he is cute! He's there to provide you more joy than you could imagine. Enjoy your time home! Im sure Mum helped ease him out into the world, to join you and help heal your heart. My condolences to you on the loss of your mother. May God give you peace and rest during this time of sadness. Congratulations on the birth of a healthy son. He is very beautiful! A home birth is not something you hear of very often, glad it went well. This post is a big ball of emotion! Condolences and Congratulations are in order. Sending loving healing energy your way! Wow! Congrats on a beautiful home birth and so many condolences on your mamas passing. How unbelievably harsh and yet to get your beautiful baby right after...... Hugs and love your way! So sorry to hear of your mother's passing. Such a sad time for you but then so happy with the arrival of your beautiful boy. My thoughts are with you. Mixed blessings, the bitter with the sweet. God be with you all, and enfold you in Love. Such a bittersweet post... Congratulations on the wonderful birth of your big baby boy! I am so sorry the loss of your mother. May the loving memories of your mom comfort you in the days ahead. Congratulations on your new son. I'm so sorry for the loss of your mother. Please know that you're in my prayers during this joyful/sad time. He is beautiful! I'm sure that your mom loved him and held him while they were together, after she left you and before he came. So sorry about your mother. So sad that your newest little one won't have a chance to know her in life. You'll have to let them know her thru memories. Congrats on the little big boy. What an emotional time for you. So sorry to hear about your Mum, not quite what you are expecting as you welcome your gorgeous son into the world. That photo of his feet is so adorable. It really shows the vulnerability of new babies. Be kind to yourself throughout the coming weeks. Thinking of you. I'm so sorry to hear about about your mother, but so happy for you and your new son. i can't even imagine dealing with something so difficult while nine months pregnant. you should be wearing a super hero cape, or something similar. congratulations on your beautiful son. I am four days past my due date as I read this and can't imagine what you've been going through but my heart reaches out and your baby is precious. Condolences and congratulations. My second son weighed 9 1/2 lbs., too, and his was also a long natural childbirth labor, so I understand firsthand what an accomplishment that was! I was enjoying your FMQ idea posts a few minutes ago, then I clicked "home" to see what you were up to lately... That picture of your son's feet would make an awesome starting point for a "baby feet" kissing design, no? The toes are like stippling waves, with bigger curves going back around for the heels. I read a novel recently set in ancient China, and it described a tradition of building a special tower model, kind of like a little doll house, filled with special symbolic things for someone who had passed away, special writings of things unsaid at the time of death, etc., and then the grieving women "sent it to the spirit world" by lighting it on fire in a little ceremony. I thought of that when you wrote about wishing you could send your mom a birth announcement -- maybe, in a symbolic way, you could do that. Oh my goodness Christina. I wish I could reach right through the computer and give you a big hug. I am so sorry your Mom passed away. Bless you and your family in this time of great sadness and overwhelming joy. Your new little man is oh so squishy and lovely! I hope I will get to meet him at a quilt guild meeting. Christina, our mothers never truly leave us - as I'm sure you feel each time you take care of your children. It's not quite the same as having them there in person, but you'll talk to her for the rest of your life. Enjoy that little man - he's quite the charmer - and it looks like his big sister loves on him too!! Congratulations on the birth of your beautiful son!!!! He is a cutie. Love the picture of him with big sis. I am very sorry to hear about your mother. She is with you always. Beautiful words to celebrate! Congratulations. I laughed and cooed at your handsome little Mister there. What a prize. I cried when I read about your Mother. That is so sad and I am so sorry for your loss, especially at this time. My mother died years ago and we were not great friends, our relationship was difficult, but to this day I still miss her sometimes. What is wonderful is that because his birthday will remind you of her passing, he'll get to know her through your reminiscing over the years. Which is a blessing for him in not missing out on his Grandma. You are in my prayers. Congratulations ,he is cute as a button. Hi. I have just found your blog and actually looked at all of your posts. (I must really like it!!) i love the inspiration and confidence you generate. It's time for me to get busy with practice pieces. A "thanks" is in order to you for your blog and i hope the new year sees you check back in every now and then, and that happiness is the order of every one of your days, no matter how big or small. Gosh, I am so sorry to read that the loss of your mother overlapped with the birth of your son. I was blessed to have my mother present when my children were born and was thankful for this every day of her life. My daughter has recently given birth to her first child, my first grandchild and I feel honored to be here to witness the life and support as I am able. I am so glad to read that you felt supported and loved as you coped with this devastating loss. I hope you feel her presence in your life as I imagine she is an angel watching over you and all that you love. If I were there, and knew you well enough that it would be ok, I'd wrap you in a gentle hug and offer as much tender love as I could express to you.